Hello and welcome back to the Affordable Locksmith of Texas blog! Lately on the blog, we have been talking about when to call a locksmith, as well as how to avoid scammers. Unfortunately, there are a lot of scammers out there that will pose as a locksmith and get your payment information. Don’t let this happen to you! To learn more how to make sure you always call an actual locksmith, read our last blog and whenever you need a locksmith in Spring or The Woodlands area call our 24 hour locksmiths! 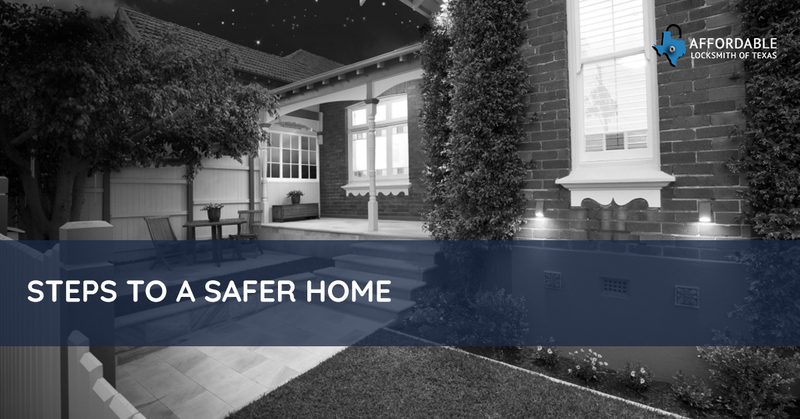 Stay right here to learn how to keep your home safe. One of the best ways to protect your home is by being secretive. Don’t broadcast over social media when you are gone from your home and be sure to have someone pick up your newspaper and mail when you are on vacation. Also, when talking about your home’s security or hide-a-key, never discuss it in a place where people you don’t know can overhear your conversation. Installing a home automation system can be a great way to not only have peace of mind that your home is safe, but also to give the impression that you are home. A home automation system gives you the option to lock your doors and to turn on your indoor lights from your phone anywhere in the world. An electronic locking system — which is the kind of lock that functions with home automation systems — can be an effective way to limit access to only those that you currently want to have access to your home. Trimming the bushes may seem like a simple task, but it can be a great way to make sure that your house stays safe. Having tamed foliage will allow for less places for thieves and other miscreants to hide. These are just a few ways to keep your home in Spring and The Woodlands safe. Stay tuned for part 2 and call our 24-hour locksmiths for all your security needs.